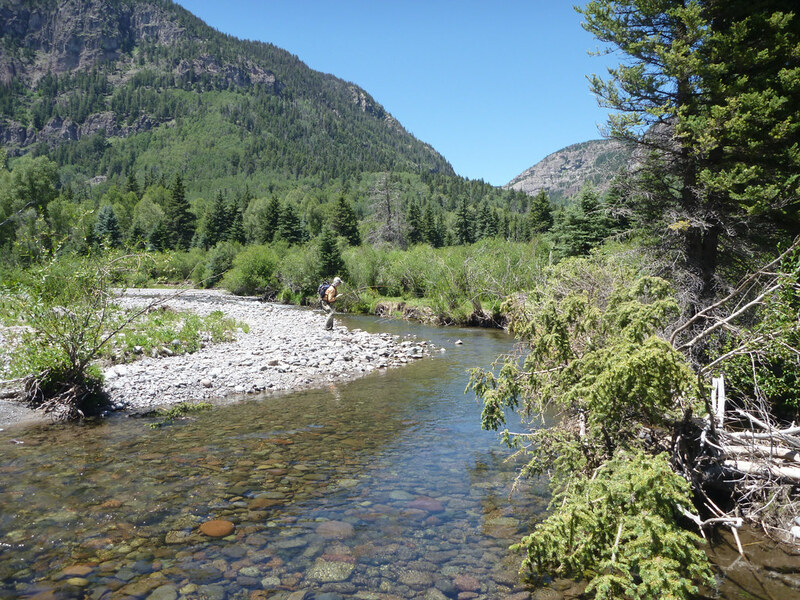 Despite flirting with the Big River earlier this summer when I think about fishing in Southern Colorado, I think about backcountry small streams. If these streams are easy to get to then the "trout fishing" is likely to fall short of my expectations/dreams that I have formed through countless daydreams over the previous winter and spring. 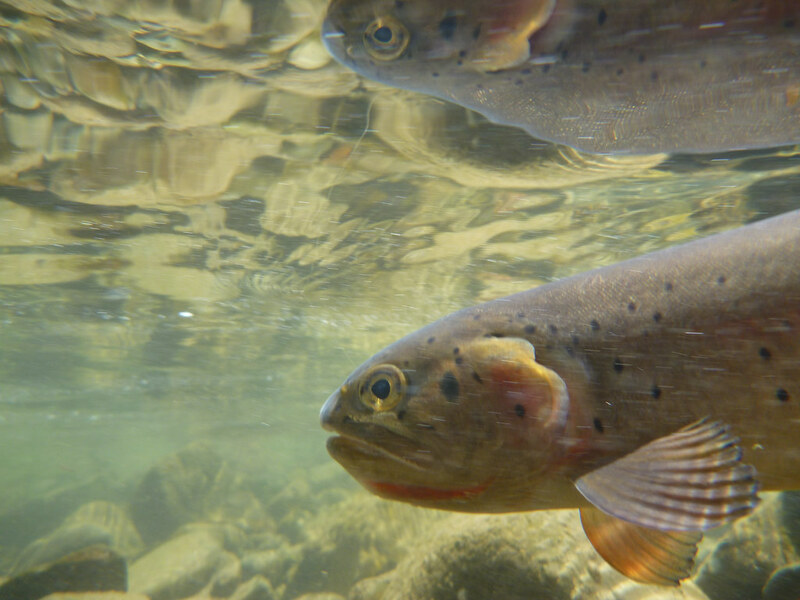 Over the years, I've concluded that it doesn't take much in the form of fishing pressure, fish harvesting, and frequent visits to change the dynamic of a stream. My own personal skill level, lack of patience, and propensity to fish only dry flies is more in tune with naive backcountry fish that see a fly only once or twice a week or a month rather than "educated" survivor fish living in a stream that flows along a well used road and see flies thrown their way multiple times a day. If these fish from public water represent two ends to a continuum then the amount of trout naiveté is directly proportional to the difficulty of access to the stream. 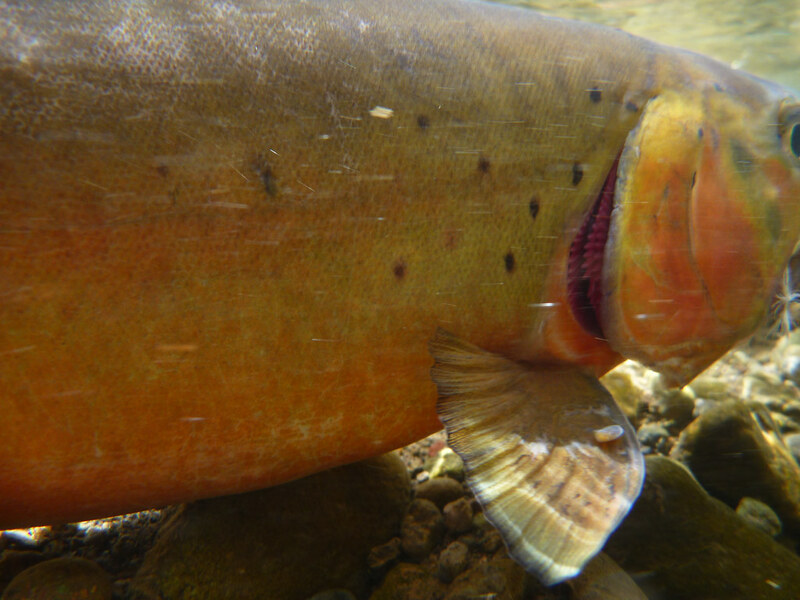 Difficult access -->; naive (and maybe native) trout. With my limited fishing skill there is only one option--hike. 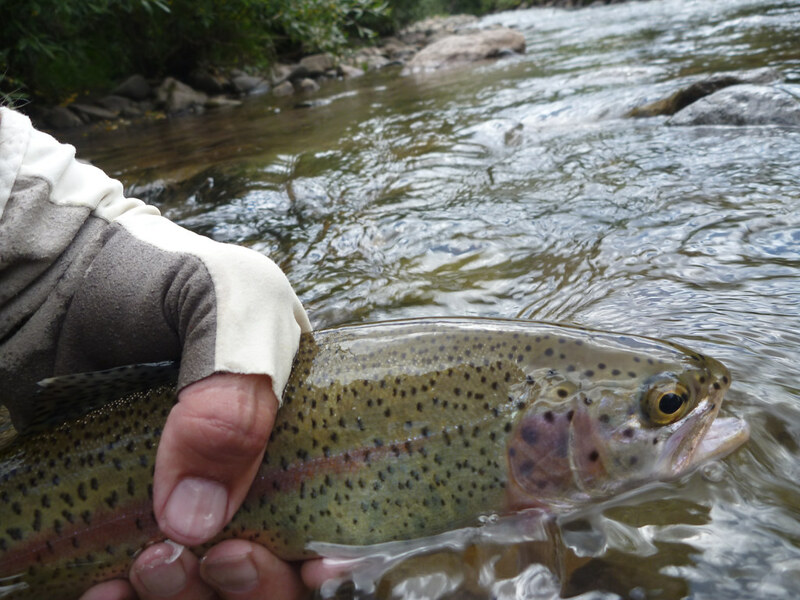 I am fortunate that Randy shares the same enthusiasm for backcountry trout. Shoot, he actually works out, running and walking over the spring so that he will be prepared for the summer hikes in the high country. Otherwise, I'd end up solo in the backcountry and my wife would probably make me by one of those expensive satellite based rescue systems. Randy is a lot cheaper than the electronics, he's retired so he can go when he wants to, he pays for half the fuel and he can cook, too. His main fault is that he'll keep fishing at the end of the day until he either catches the most or the biggest fish. ;-) This year's trip to the mountains had a pretty ambitious itinerary. We hoped to do some backcountry camping but instead chose all day hikes so we could maximize the number of streams visited. Of course, we had to check in on some old friends but we also hoped to find some new streams. Day 1: Seeing that we are flatlanders who spend most of our life at 1000 ft. elevation rather than 10-11,000 feet, we always try and take it easy the first day after arriving. 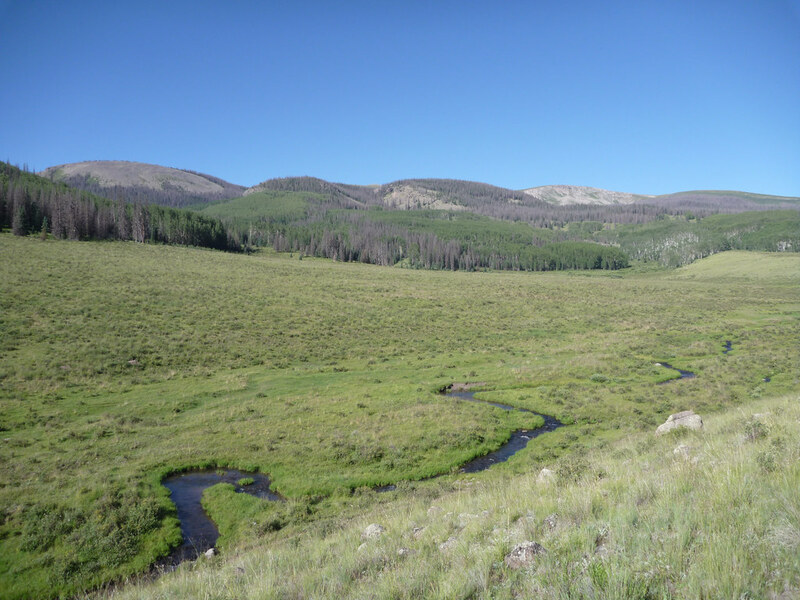 Typically, this means a short, mostly flat 2 - 3 miles hike into a small stream that flows out of one of the nearby wilderness areas. I've reported on this stream multiple times in the past. It is a brook trout stream. I've never caught anything else. 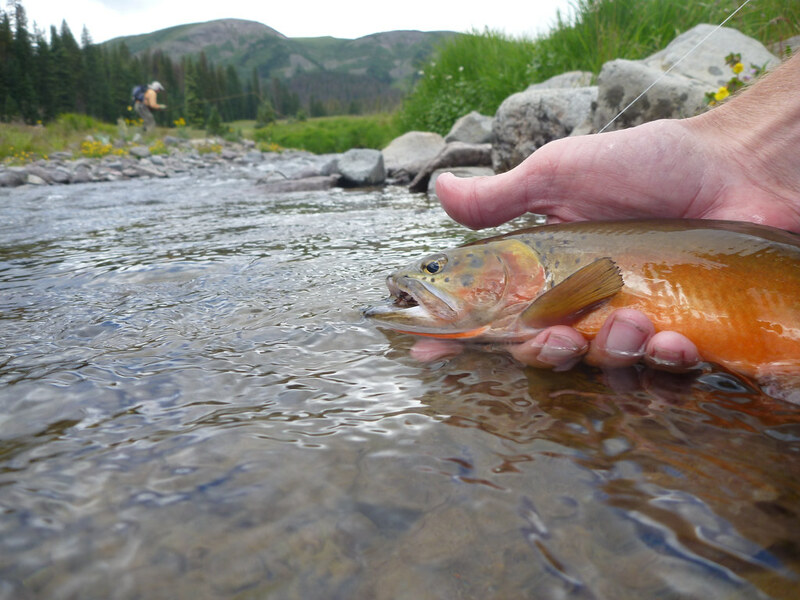 It is a great stream for beginning fly fishers or to re-acquaint veterans with just how fast the strike on a dry fly by high-altitude fish is or maybe it just reminds us of how slow we are. This was my second time, this summer fishing this stream and I was a bit disappointed. There does not seem to be the numbers of decent sized brookies in the stream that we have found in the past. Part of that is due, I'm sure, to changes in the stream bed and pools but part of it may be due to increased pressure. This is one reason, that I don't name the streams we fish on--though with a bit of work a person could likely figure most of them out. We didn't see any other fishing folks this trip but we did last year. 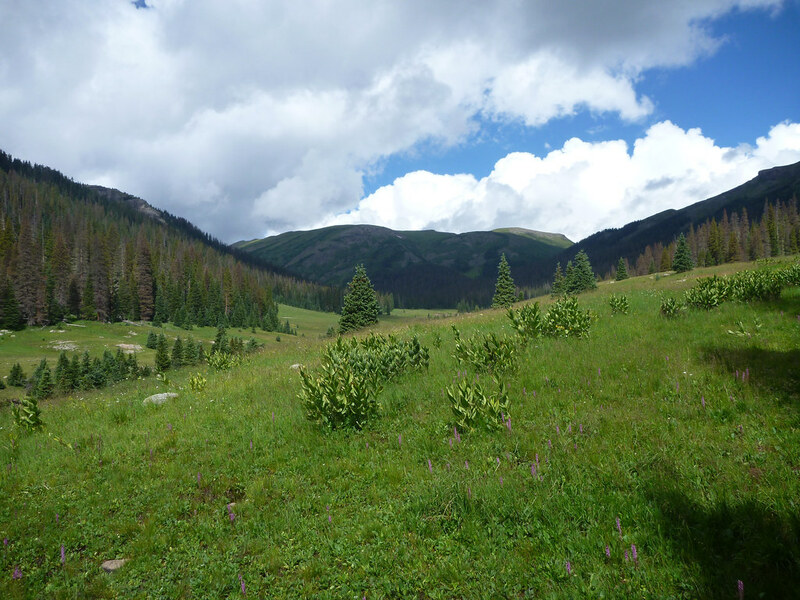 Still, fish were caught, it rained, it hailed, we survived and we acclimated to the altitude--at least in our imagination. We did have one casualty. Randy broke the tip on his fly rod as he was stringing up. He had left his spare back at the trail head so he fished with a broken rod. Most of the brookies were caught on 12 and 16 sized parachute adams. Day one total: 5 miles. Trip total: 5 miles. Day 2: We revisited a stream that is over 20 miles of highway, 20 miles of dirt road and 8 miles of mostly four wheel drive road away. It doesn't matter that the roads are a bit rough and long, the fishing along the road section of this creek fits the description of being fished out There is always two to three groups of campers in the meadow near the road. I can see why, I'd camp there also if I could be by myself but it is clear from all the campers why the decent fish seem to be nonexistent in this meadow section. 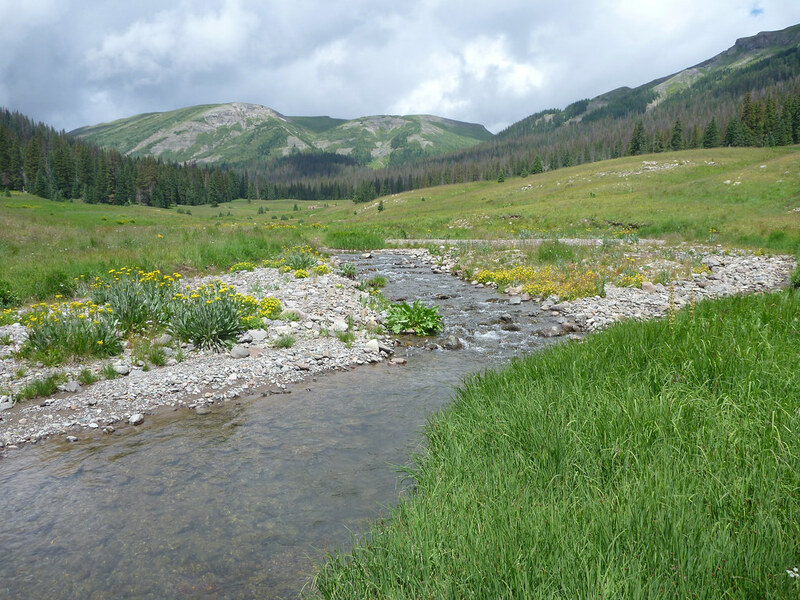 Away from the road this is a wild trout stream with a mix of cutthroats and with brookies invading lower down. 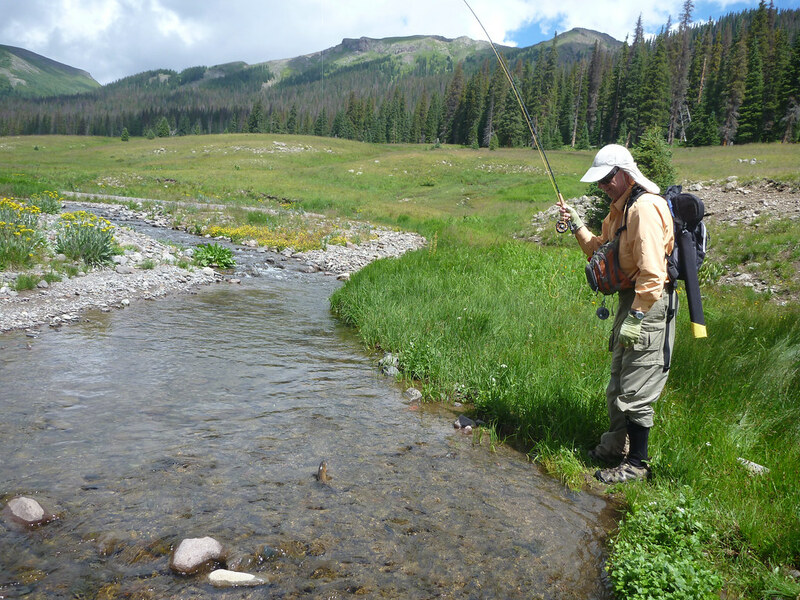 The stream is drop dead gorgeous throughout it's headwaters with waterfalls, plunge pools and meadows but if you are going to catch fish on this stream--you guessed it--you've got to hike or more appropriately; bushwhack since there are no constructed trails. Our destination was just a few small pools where last year we had great success. After a 3 to 3.5 mile bushwhack we arrived at the pools to start fishing. Randy was again haunted with unbelievably bad luck. He never walks with his rod assembled and not rigged but for some reason in his excitement to get to the water, today he did. You already know what happened. He did lost the tip to his rod on the way in and had to fish a second day with a rod with a missing tip. It certainly put a damper on the trip at that point and I heard later that someone reported that they had heard the scream of a Sasquatch in the area on that day. Randy does have big feet (he's a former college BB player) and he did let out a primal yell when he realized what he had done but I would have thought that a Sasquatch wouldn't scream the same obscenities that Randy did but who knows. We did manage some fish in the stream. To tell the truth I think I liked sitting there just watching the feeding cutthroats in a fast, deep run under a grassy bank feeding. I couldn't quite bring myself to actually interrupt their feeding. Of course we eventually offered up our flies and caught a number of fish. We fished parachute adams and smallish PMX's in Royal. Day two total: 7 miles Trip total: 12 miles. Day 3: Unfortunately, we had to spend most of day 3 getting a slow-leak fixed in one of my tires. Like Randy's rod from the day before, I was not using my head, thinking I could get just one more Colorado trip out of my tires before I changed them. No primal screams over the tire but I felt pretty stupid. I tried to get it fixed late Sunday at a Walmart 60 miles away but they declined to work on the tire due to it's condition and they didn't have 4 new tires I wanted in stock. There was plenty of tread but between some of the treads dry-rot cracks were starting. We were able to find a local garage that would fix it only 40 miles away but it cost us the morning. (BTW, there are 4 new tires on the truck, now.) We decided to take along our camping gear and drive to another valley, set up a base camp for two nights and explore some new streams. Day three total: 0 miles Trip total: 12 miles. 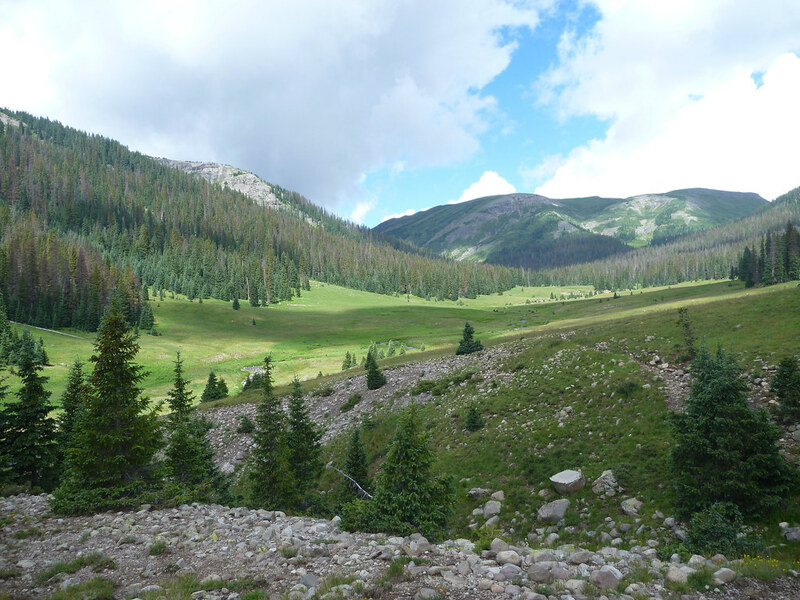 Day 4: Two years ago we walked 5 miles up a valley into one of the nearby wilderness areas looking for a stream we had heard about. At about mile 3 we had a choice between two streams. You can probably guess that we "chose poorly" based on the size of the streams. We caught fish but not like we had expected. Later we found out that the "road less traveled" was the better choice for fishing. That is where we headed for day 4. We set out early, walking a brisk pace for the first 3 miles we'd been over before. 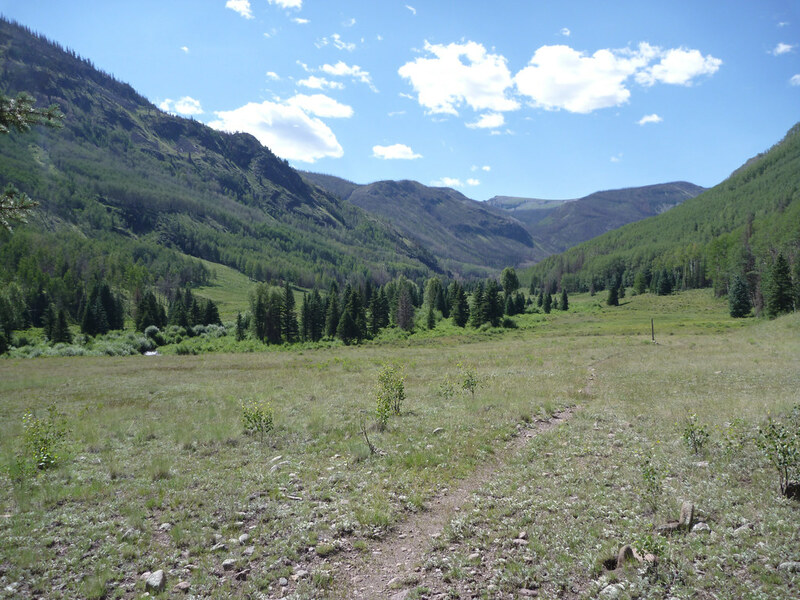 This time we took the "road less traveled" and quickly found out why it was "less traveled". For the next mile we struggled up about 1200 ft. of the mountain on the muddiest and some of the steepest set of switch backs I have seen in this part of Colorado. We saw no bootprints on the trail which was promising since we'd had seen a group camping on the stream back down in the valley. We were a mess. 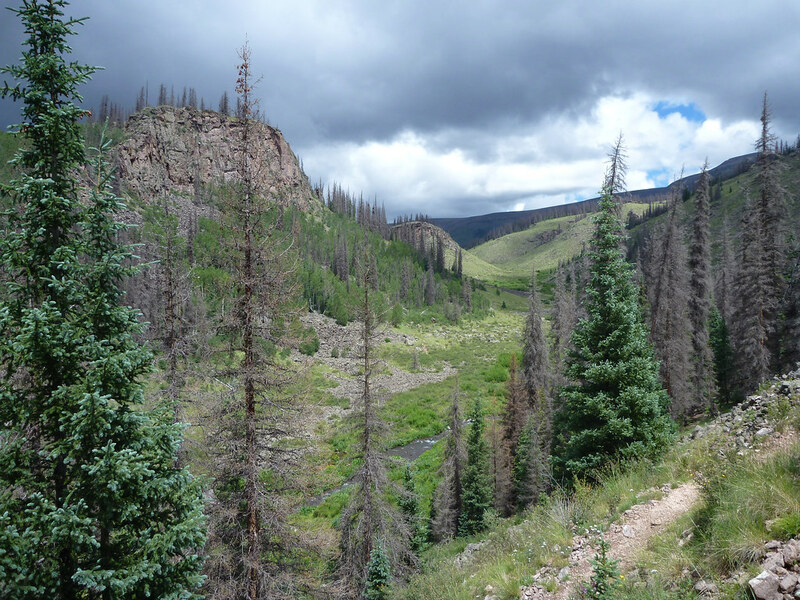 The trail eventually leveled out on a canyon rim with the stream far below. We continued another mile or so along the rim waiting for the stream to "catch up with us". 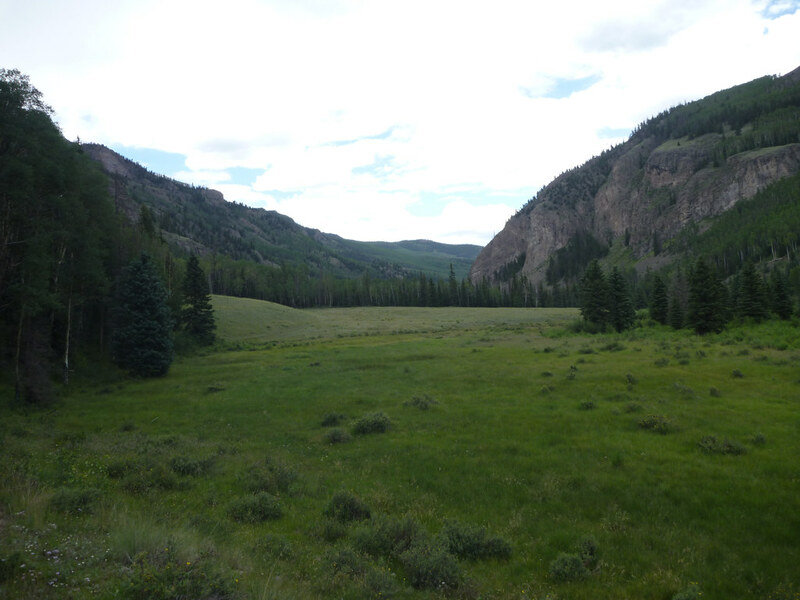 The stream and trail came together is a lush, high valley meadow. It looked like it could storm at any moment and with no one else in sight we set to fishing. This was pure Rio Grande Cutthroat fishing. Apparently, the canyon section must have a number of falls. We'll have to go back and see if we can access that part of the creek someday. 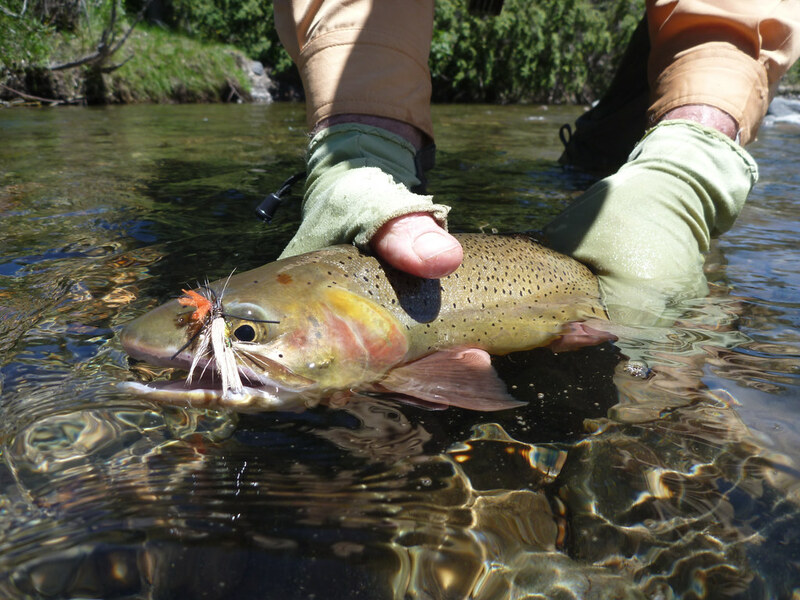 But for this trip the meadow section produced some of the prettiest fish you'll ever see. The rain held off and we continued to fish until it was time to get back to camp. Most of the fish were caught on size 14 Royal PMX's and on size 12 parachute adams. Before we left, my wife had cooked up and froze a bunch of chili for our trip. We saved it for our first night camping. Wow, was it good after a hard day hike and with the temperature falling into the 40's. I probably ate too much. No, I know I ate too much but I really can't stop eating chili in those conditions. I'm just lucky I finally ran out. As we sat around the campfire we contemplated the next day's plans. We had set two, new stream goals to explore on this trip. The success of we had in this high valley for the first goal had us thinking hard the next day's goal. But as I looked over the maps for the next day's hikes/bushwhack, I realized that I had not done enough careful analysis of the map. I told Randy, that I doubted we could make it to the next day's goal but we had a backup. Day 4 total: 11 miles Trip total: 23 miles. 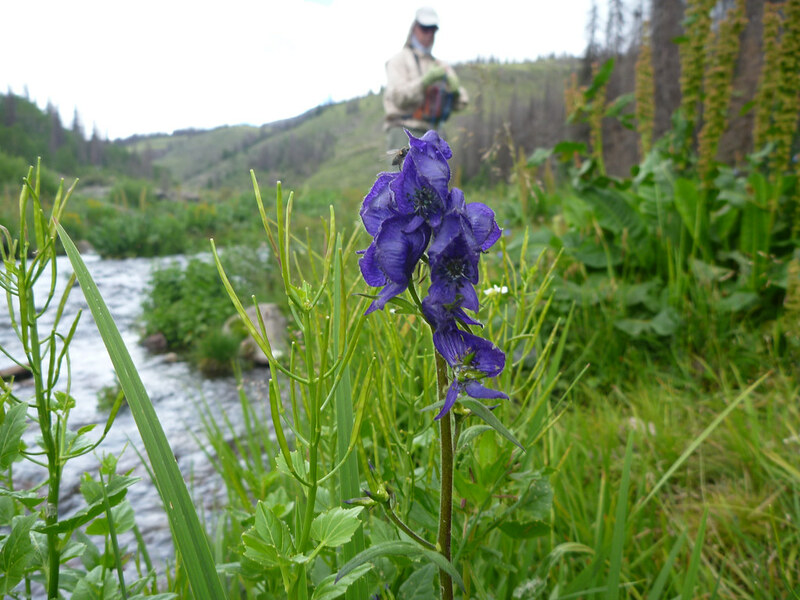 Day 5: Last year we had hiked into a beautiful stream and caught no fish. Later, we tried again, so we thought we had this stream figured out. 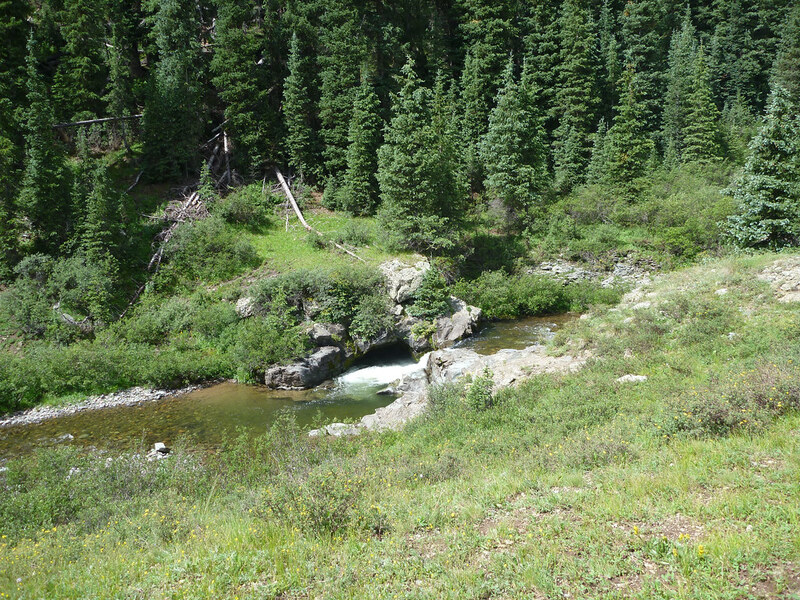 The target stream we wanted to explore was a remote tributary of this main stream, in a high, hanging valley. 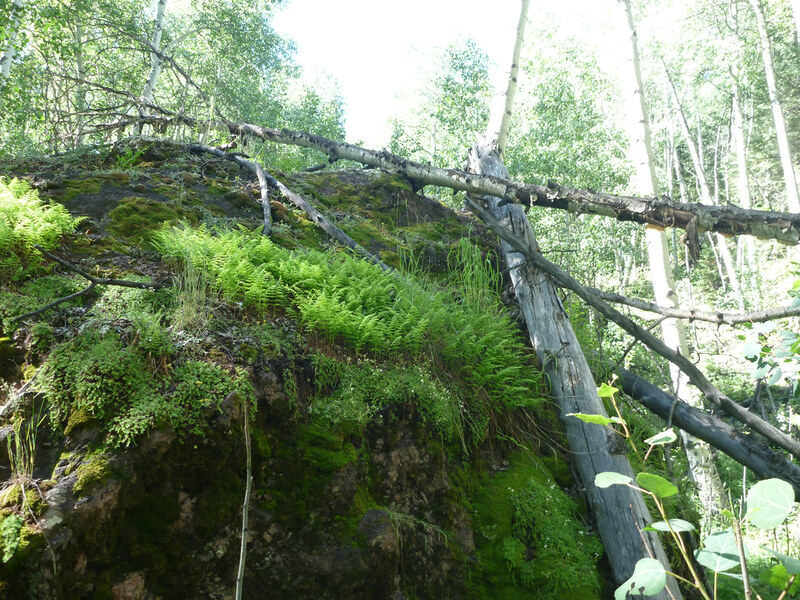 Our approach was to try and bushwack into the base of the stream and then hope to find a path up 1400 ft. of slope. We hiked in three miles and then bushwhacked to the base of the stream over elk trails, crossing the stream multiple times. 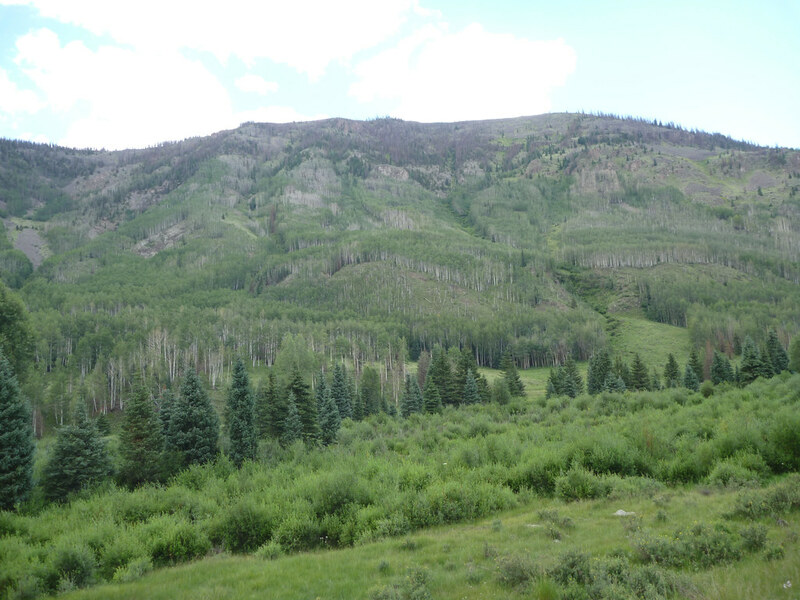 But after getting ourselves in a number of questionable situations during the bushwhack I decided to call off the exploration before climbing the steep slopes and outcrops looming above us. We'd just have to settle for our back-up stream which was on down in the valley. Next year, we'll re-target the original hanging valley stream by dropping in from above. It'll be a longer walk and a higher walk but a safer walk. As to the back-up? We fished almost 2 miles of water and saw a total of 4 fish. Randy caught two and I line spooked two in a quiet backwater. I got to say we were just a little discouraged, especially after last year and thinking we had the stream finally figured out. It could be there are just not many fish in this stream under these conditions. 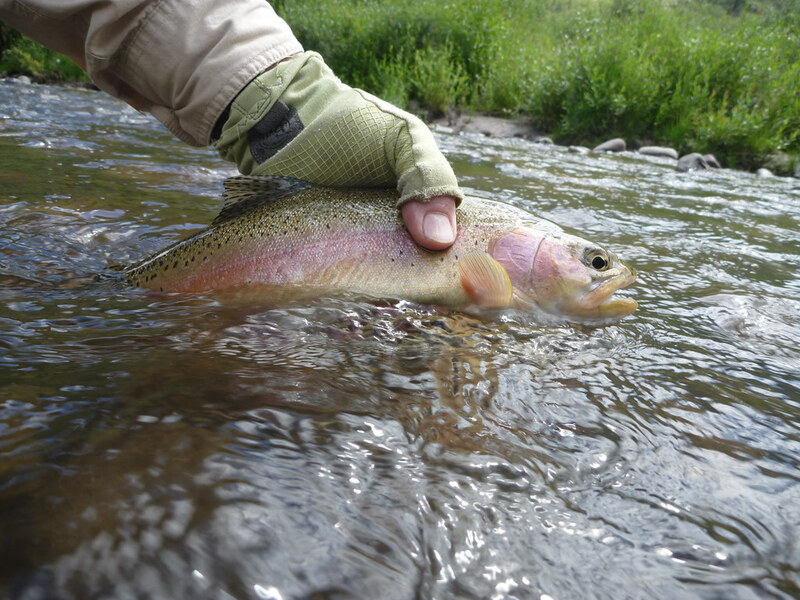 Randy caught a very nice cutthroat early-on after watching it rising in a nice run along an overhanging bank. Naturally, we thought we were on to a great day. Wasn't to be. Most days this one cutt would have been enough but our past history with this stream left us wanting more. We were so discouraged we packed up and headed in to town for a meal at the brewery. Day 5 total: 9 miles Trip total: 32 miles. Day 6: We thought we'd take it easy on this day since we still had a large hike ahead of us on this trip. 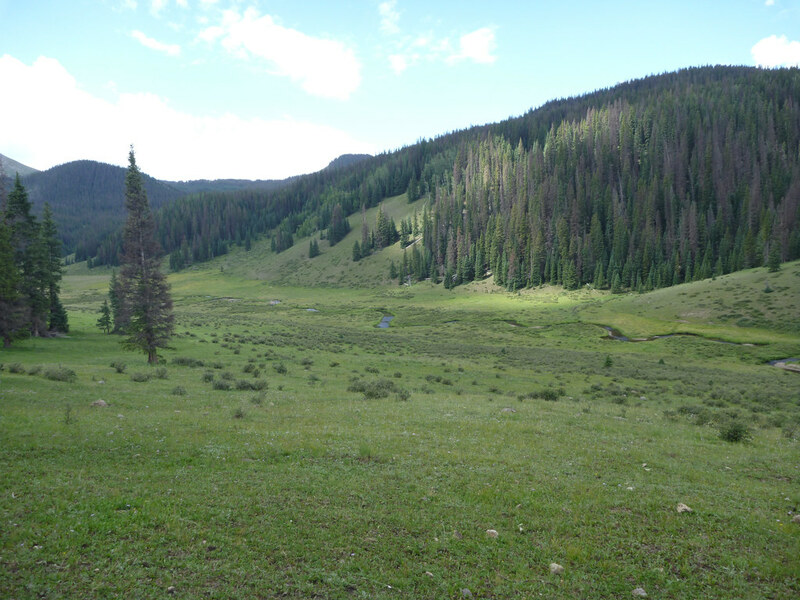 I had heard about a meadow section on the upper parts of a nearby, well known creek that one could drive to. I had never fished it thinking there was simply too much pressure but suggested to Randy, we might as well explore some new, to us, water. We set off and drove up to this upper section and it was a beautiful site. Maybe we were just early but we didn't see any other fisher folk in the entire valley. Naturally we hustled down to the stream, split up and started fishing. As we did, another fisherman drove up and established himself downstream from us. As we turned to go back upstream a party of 4 showed up and established themselves upstream. It's the kind of thing you should expect in this type of public accessible water. After all, they were doubtlessly thinking the same things about us taking the best part of the big middle. This is the type of stream though, where you had best be the first one on the water if you want to have a good day. Randy and I both started off with nice cutthroats that surprised us. I was expecting brookies and browns in this water which is mostly what we ended up catching. The fish were spooky and for the most part you had one chance in each pool for one fish. Later on, I switched from a 3x tippet down to a 6x tippet and put on a size 18 parachute BWO to match the smaller mayflies coming off on this stream. When I did that I was able to catch 2 to 5 fish per pool. None of the fish matched the size of the first two we caught but it was an enjoyable section of stream that I very well may return to in the future. Later in the day, we let the Big River tempt us. It had been running with a lot of sediment over the course of the week. It had cleared a bit so we decided to see if we could dredge up some of the larger fish on nymphs or just maybe catch an evening caddis hatch. The caddis didn't come out but I was able to find a nice brown (no photos) with a rubber legs in the same run I'd fished with dries back in July. Day 6 total: 2 miles Trip total: 34 miles. Day 7: Two years ago, I took Randy back into a stream that has seems to produce just a few fish per mile of stream. But what these cuttbows lack in numbers they make it up in size and fight. These fish really put on an aerial display when hooked. I had one, this summer jump 5 times in a very small pool. 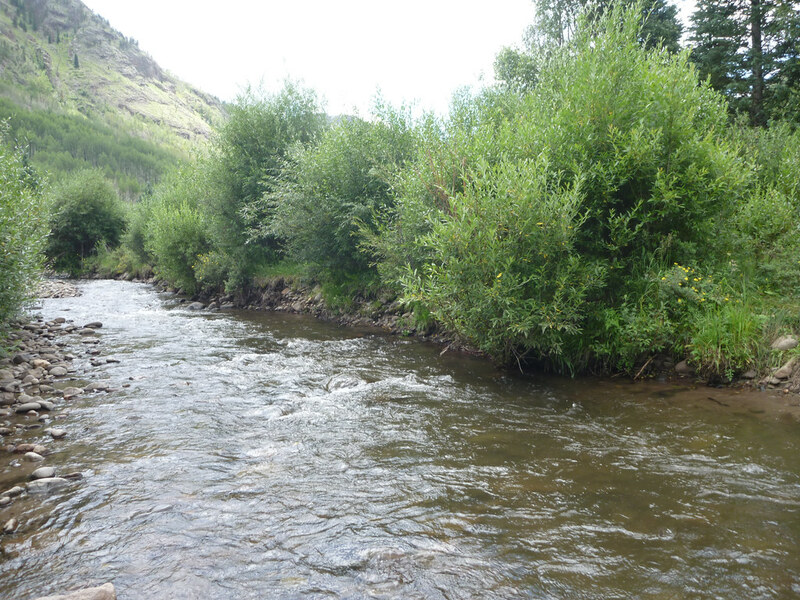 The problem with this creek is that the section I like to fish is about 5 miles in and with some serious altitude change. Two years ago, Randy found this hike to be the most challenging of the hikes we took to fish but thought it worth it. It is the hike that he uses to measure how well his fitness program is working. Last year we couldn't get into this stream due to the fires in the area. This year we had no choice but to make the hike. We left the cabin at dark-thirty and drove to the trailhead. The temperature was 41 degrees F and not a cloud in the sky. We made great time and arrived at the stream by 10 and then spent the next 4 hours searching for and finding nice cuttbows. As I said, the fish are pretty scattered along this creek but there is one hole that has produced for me several times. 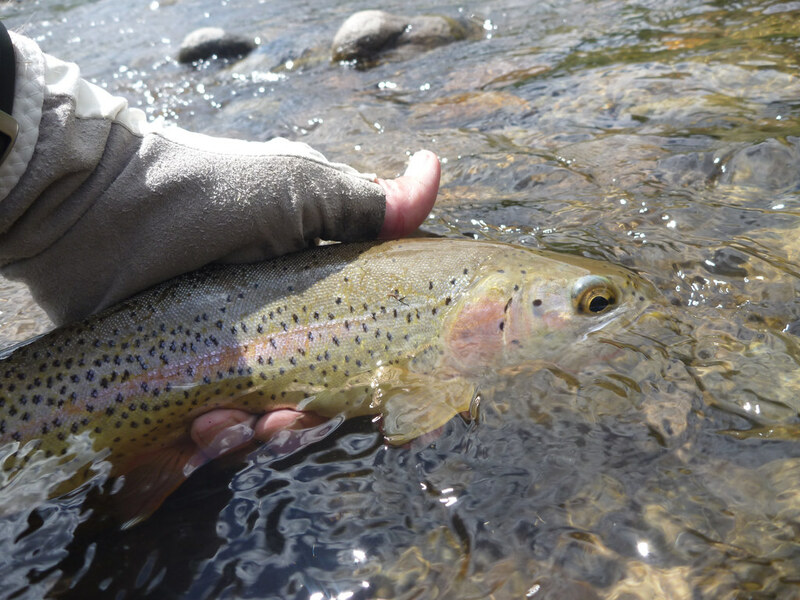 The last time we were there, Randy and I had split up and I ended up fishing the hole, catching 4 nice cutts in a short time out of a very small section of stream while Randy watched. He wouldn't come down and try his luck. This year after we split up, he ended up at this hole and quickly caught two very nice cutts--the biggest of the trip (no photos, so no size estimate) while I was fishing this run. He then went looking for me to try out the other side of the hole. I tried to talk him into finishing but he insisted. The hole was mostly spooked (fighting large fish in small water will do that) but there was a small eddy off to one side of a big rock that I thought might hold a fish...Well it did. I drifted a #12 parachute adams into the foam line in the eddy. The water was a bit off color from burn-run-off so I was close enough to hold my rod high enough to let the fly to circle the entire eddy. As the fly was starting the second time through the foam line a very large cutt emerged vertically in the foam, mouthing the fly. Only the head to the gill plates emerged above water but there was at least 6 inches of fish head 4 foot in front of me with a fly in its mouth. I have no idea why I didn't connect. I know I was already thinking about how long the fight was going to be and how I would handle the jumps in this little pool. I know that I let out a yell and stomped around the gravel for a while. For whatever reason, I didn't hook up. But I'll take something back more valuable. 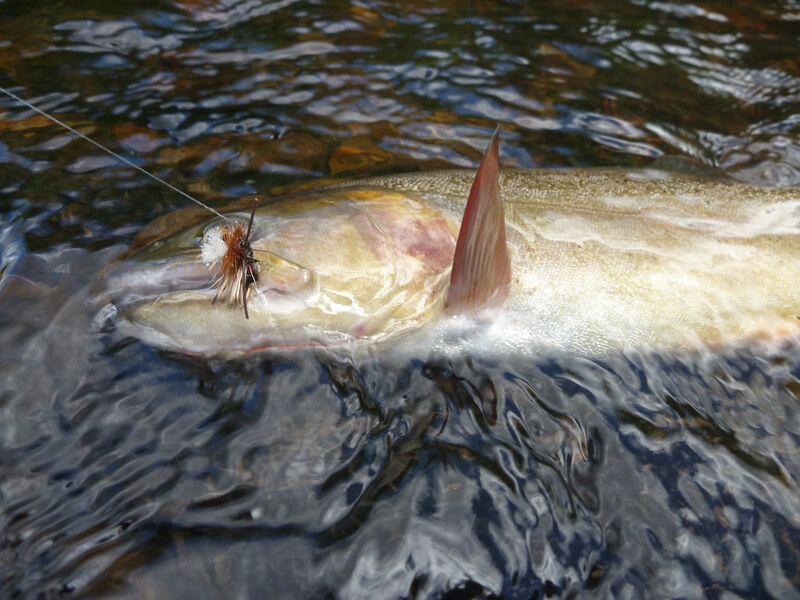 Likely, that rise and gaping maw will haunt my idle thoughts that eventually get to fishing high mountain streams and tend to increase in frequency over the winter. No doubt these memories will drive me to put out the effort to return to this high mountain valley for another chance. We made it out in pretty good shape--only taking 1/2 hour more to hike out than hike in. We went far further up the valley than we had in previous year which added to our hike. Day 7 total: 13 miles Trip total: 47 miles. 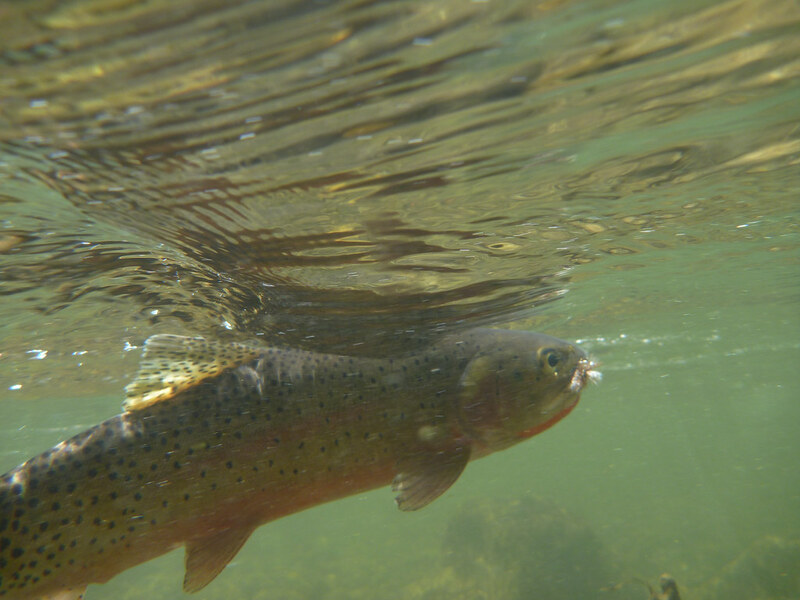 Day 8: Essentially, we took the day off again from backcountry fishing, fishing the Big River upstream with PMX's and caddis. 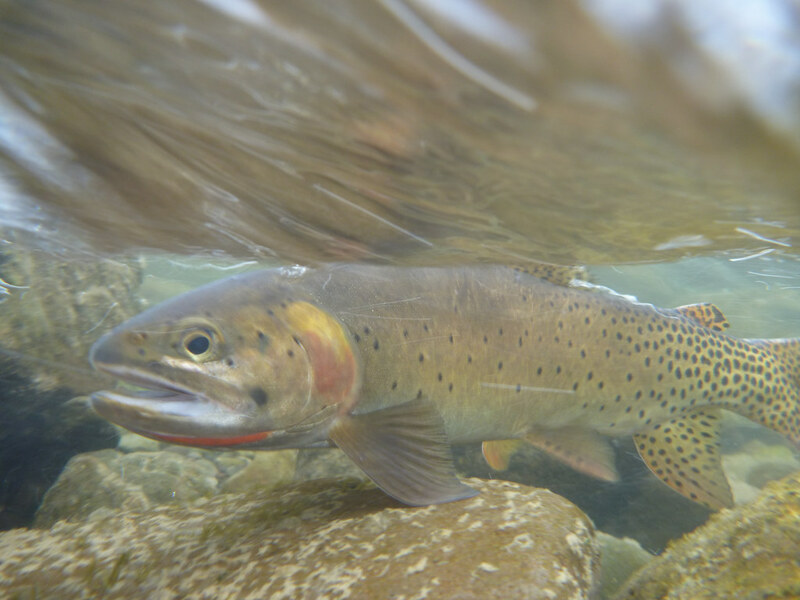 I wanted to try and fish a beautiful section upstream that I had found very productive in July hoping that we could catch a few looking up. I started off catching two in a long riffle on a #8 Royal PMX but only had two other looks over the rest of the morning. Randy, as usual was much more persistent. He worked more water, more thoroughly and was able to hook up a few more fish including a nice rainbow to wrap up the trip. Day 8 total: 1 mile Trip total: 48 miles. What a great trip. Physically, we found we can still visit the wilderness streams. We visited familiar water. We found new water that we will no doubt return to. And we created new memories that are already inspiring our plans for next year. 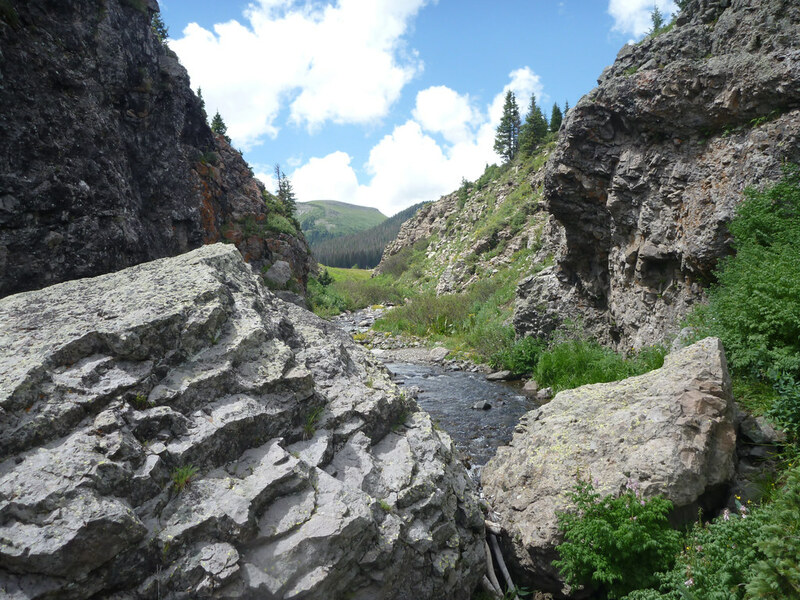 Heavenly looking day trips & pics, ksbioteacher. Thanks for sharing. What a great area to fish. Lovely water and great photos. Thanks for a nice trip. wonderful trip report. We will have to compare notes as I was out there at the end of September. 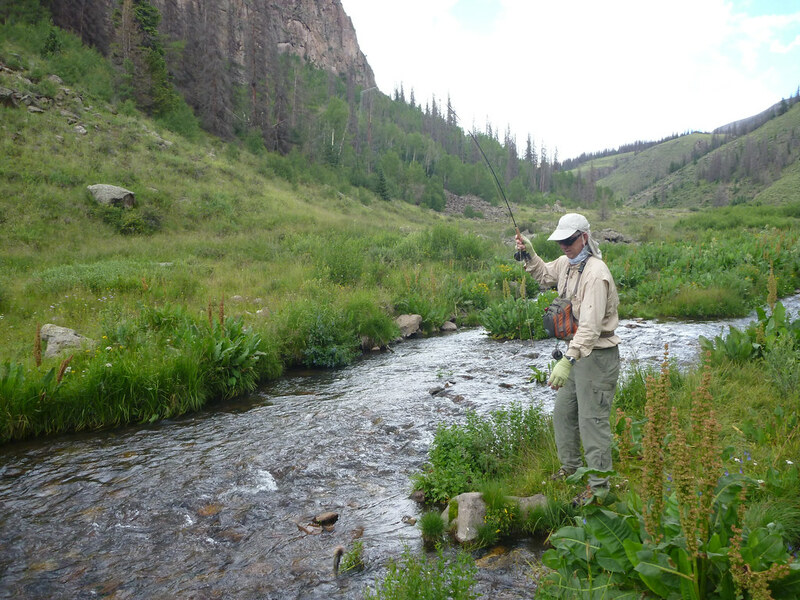 We have at least one stream that we fished in common and maybe two can't tell from your pictures. As always I enjoyed your report and will try to get mine done sometime soon. Beautiful Pictures !!! I lived outside Alamosa, Colorado between 1982 -1989. 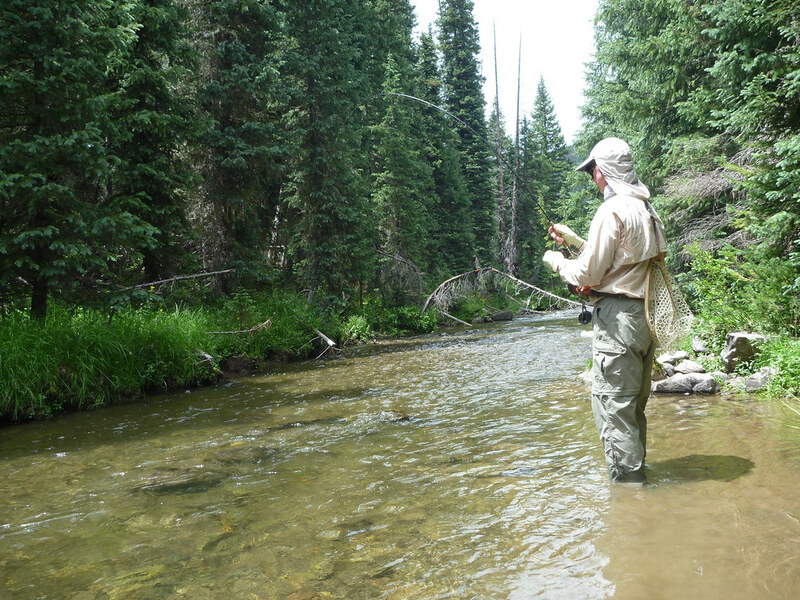 I Fly Fished many of the Mountain Wilderness High Lakes and Streams, as well as the more well known waters. I also spent a lot of time Archery Hunting, as well as Duck and Goose Hunting. Thank you for reminding me how beautiful and special this place is !!! Wow looks great ! I lived in Montana a life time a- go . Now fish NY Adirondacks and Vt, Green Mt. All times are GMT -5. The time now is 08:38 AM. All content copyright of the respective posting members. Please respect our Community.